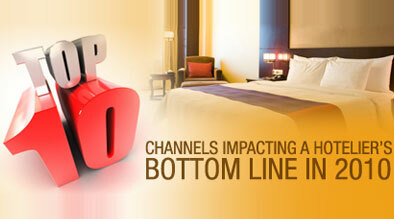 Top Ten Channels Impacting A Hotelier’s Bottom Line in 2010 . . . And Leveraging Them Effectively! For the lodging industry, 2009 was a challenging year, and forecasts indicate that the lodging industry recovery will be a slow and demanding process. The smart hotelier should keep a laser sharp focus on the channels that are driving maximum return on investment. The following are the top 10 promotion ideas, channels, and strategies that we recommend to hoteliers in the New Year. These tips and insights are based on carefully analyzed industry search trends and channels that are driving maximum returns for Milestone’s clients and partners. 1. Rate Parity and Direct Distribution Channels: It is crucial for hoteliers to maintain rate parity across all distribution channels. 2009 was a year of rate sensitive shoppers and major discounting. The number of shoppers looking for a bargain will continue to rise. In order to build trust from online customers, hoteliers need to focus on maintaining rate parity across all of the channels. According to recent studies done by PKF and Nielson, business coming from direct distribution channels, such as email marketing, brand sites, independent websites, blogs, social media channels, and mobile devices, will continue to increase in 2010. Hoteliers need to maintain an intense focus on these channels to ensure the maximum ROI. 2. Remember the 3 C’s – Consistent Rich Content (information) across all Channels: This is still a very important criterion for your online success. Start with a well-defined keyword strategy and marketing plan. Identify all of the reasons why people are traveling to your area while creating the content strategy for your site, GDS, CRS, etc. Your ultimate goal is to create content that offers online surfers what they are looking for and incorporates keywords that surfers are using to search for information. Make sure to update all of your online profiles, including hotel description on airline systems and CRS with enhanced content. This will help in maintaining consistent information and relevancy across all distribution channels. 3. Define and Measure ROI on SEO Investment – On-Page and Off-Page Factors: Your promotion strategy should be built on a sound foundation – your website. Make sure your site incorporates the crucial factors necessary for your site to perform well. These factors include on-page factors, content, download time, duplicate content and URL issues, and off-page factors such as securing links from credible directories, websites, and maps. 4. Mobile Marketing: Mobile Marketing is exploding exponentially. Mobile users, with shorter attention spans and limited time to browse, are looking for instant information and/or a bulleted list of relevant information to help them make a decision quickly. There are four times more cell phones than PCs worldwide; therefore, it is crucial to leverage this channel. With the evolution of smart phones, browsing on a mobile phone is the norm! According to a study by PhoCusWright, 77% of business travelers and 57% of travelers have used a mobile device to find local services such as lodging, restaurants and attractions. 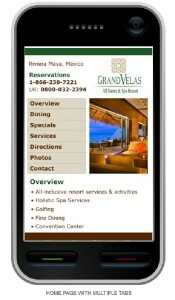 All of the major brands and OTA’s have mobile initiatives in place, including mobile compatible websites. As a first step, make sure you have a mobile compatible website and are enrolled in mobile friendly directories. Other key initiatives a hotelier can engage in and measure ROI with are Custom Mobile Apps, PPC campaigns targeting the mobile audience, mobile friendly coupons, and SMS marketing. 5. Social Media: The most successful brands in 2010 will be involved in social initiatives. This means real people talking to customers in real time in the digital world. Active participation in social media not only helps in building brand reputation, but helps in gaining links and the lion share of universal search results. Take the first step and create a comprehensive strategy before you create your Facebook or Twitter profile. Kick off your social strategy with a well-defined, compelling blog. Your blog should focus on the reasons to visit your hotel/destination, so that it can generate local links. 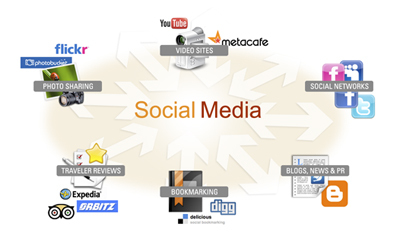 Blogs should be connected on all social media channels, such as Facebook, Twitter, Flickr etc. The goal is to generate content that compels people to tweet or write about you. Hoteliers should create a defined marketing calendar to update all social channels on a regular basis. Smart hoteliers will leverage and utilize social channels to connect, engage, and market effectively. It is easy to connect your blog to your Facebook and Twitter accounts, add pictures on your Flickr account, and add videos on your Youtube account. Reference videos and pictures posted on different social channels when writing a blog post and while setting up your profiles. 7. Paid Search and Tracking: Paid search offers a phenomenal opportunity as long as it is targeted and tracked. Define paid search performance metrics and specific goals before you start. Target different channels, including mobile, content, search, local, etc. Key tips for paid campaigns to do well include well-defined time sensitive offers, A/B testing, and targeted landing pages. Search engines offer a click to call feature to target mobile users. Try out different channels and analyze the channels generating the maximum ROI. Test everything you are doing. Set up measurable goals, such as increasing CTR by 2% and reducing costs by 5%, then complete the keyword research, write ad creative, and define compelling offers. After launching the campaign, further analyze and optimize your campaign based on the results. Keeping up with latest tools and ongoing research are important to ensuring maximum ROI from paid search. 9. Local and Map: Consumers are increasingly doing local-based search when looking where to spend their dollars. When searching the Web, it is hard to miss local results that show up on top of organic results. Within a few clicks, you find customer reviews, ratings, detailed maps, directions, contact information, and more for a business. These results can drive very high-qualified traffic to small businesses with very low cost. Hoteliers need to pay special attention to local results. Figure 1 shows the placement of Local Search Results on Google’s Search Engine Results Page. As a first step to leverage local and map results, make sure that your listing on the local search engine map is claimed and your local profile is enhanced. To avoid duplicate information about your hotel, ensure that all the major online yellow pages are listing consistent information about your business /hotel. Leverage local profiles by updating coupons, video, social media profiles, pictures, etc. Local Map profiles on the search engines act as an extension of your site on Google or Yahoo! domains. The key is to ensure that these profiles are accurate up to the moment. These measuring criterion can change based on the market or on the business’s set goals. Focus on the direct impact that your SEO efforts are having on your business. It comes down to tracking conversions. It is imperative to set and measure KPIs, optimize campaigns, test, and strive to improve conversions. it is interesting to see how a small investment can have a tremendous impact in your customers expereince and your bottom line.